What a tease for my Instagram followers; I posted a photo of this delicious potato soup telling you to stay tuned for the recipe you won’t want to miss and then waited a whole week to post said recipe! To be fair, I wasn’t just sitting around saying eh, maybe tomorrow. The week’s fly by and this past one was busy, but it finally led me to a relaxing Sunday morning with perfect weather for getting cozy on the couch with our puppy and writing. It’s pretty gloomy outside, but much warmer than this time last week. Last week was basically like living in a snow globe; it snowed throughout the weekend and the temperatures were frigid! Luckily, we didn’t have any real obligations so dare I say I kind of enjoyed the weather. It really is pretty to watch the snow fall and turn those bare branched trees into beautiful winter scenery. It also makes hot soups smell better cooking and taste better eating. There’s no logic behind that statement. It’s just true. The fun part about writing this post a week later is I can also share the highlight of this weekend! My brother proposed to his girlfriend yesterday and we all got to be there to celebrate with them right afterwards! We were at a local bar where they display all beers on tap on a digital menu and yesterday #55 said ‘Kate Will You Marry Me’ rather than listing the brewery and beer name. The best part was her reaction; she was so surprised and they were both beaming with happiness! Oh yeah, she said yes 🙂 It was such a sweet moment. And now starts the fun of wedding planning for them! And for the rest of us, looking forward to a vacation at the beach where they plan to say I do! Speaking of vacation, let’s get back to this soup for a minute. My Mom found this recipe years ago and it’s Disneyland’s potato soup! I’ve been to Disneyland once, but did not come across potato soup while there so I can’t tell you how closely this matches it. I can tell you it’s officially become the only recipe I follow when making potato soup. It turns out well every time and the leftovers rarely last longer than a day in our house. And since you don’t need an entire package of bacon for the soup, BLT’s make the perfect addition to complete your meal! It doesn’t get much more comforting than this. Please come back and let me know if when you make it and how you liked it! Next on the soup menu is Taco Soup that I’ll be making with single steer ground beef we ordered from Farmers to Families, the same place we got the delicious Pork Roast we cooked on New Years day! Share your favorite go to soups in the comments; I love getting ideas from fellow food lovers! In a 6 – 8 quart stockpot over medium heat, fry bacon until crisp. Remove bacon and drain on paper towels. Once cooled, chop in small pieces. Add flour and chicken broth in a small mixing bowl and whisk to blend. Pour over potatoes and vegetables in stockpot and stir to combine. Add half the bacon and season with salt and pepper. Stir again and allow to simmer for 25 minutes or until potatoes are soft. 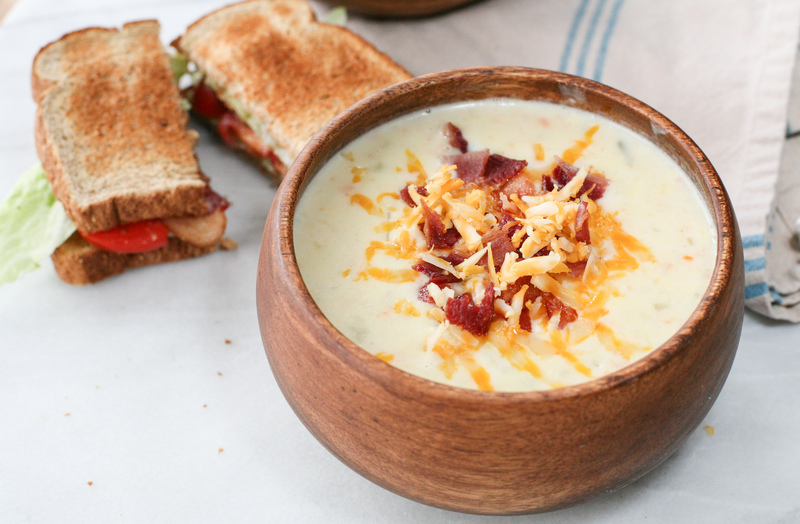 This entry was posted in Dinner, Lunch, Recipe Book and tagged bacon, BLT, comfort food, creamy soups, easy winter recipes, homemade potato soup, loaded potato soup, potato soup recipe, simple soup recipes. Bookmark the permalink.